In 2016, UBC Brock Commons demonstrated the future of construction, challenging traditional building materials such as steel and concrete. The landmark building on the University of British Columbia’s Vancouver Campus reached structural completion in record time; the structure was topped off on August 12, 2016, when the final CrossLam® CLT panel was placed. The significance of securing the final prefabricated mass timber panel is remarkable. Structurlam manufactured the building’s mass timber package, including Crosslam® CLT panels and Glulam PLUS pillars. 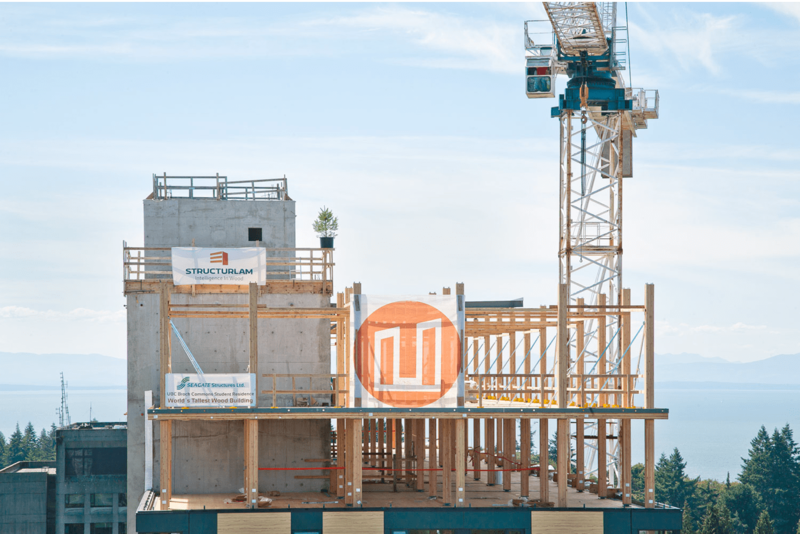 Beyond supplying the materials that made up the major structural component of the 18-storey tower, Structurlam’s unique approach to construction led to structural completion much sooner than anticipated. Structurlam’s advantage lies in an innovative approach to design, engineering and production machining. It is this unique and leading-edge process that allowed Brock Commons to be completed in only 69 days. 3D modeling software was used to virtually construct the building based off of architectural and design plans. The models were used to identify all the necessary components to be manufactured, including CrossLam® CLT, Glulam PLUS and steel connectors. The 3D model was also used to create a manufacturing list for efficient purchasing. Prefabrication of the mass timber components took place at Structurlam’s facility in Okanagan Falls, BC, allowing the building process to move much faster than anticipated. After the building components were completed, the materials arrived on site in the exact order in which they were needed for installation, allowing for a swift, streamlined assembly. At a pace of one floor per three days, the entire process took an impressive total of only eight weeks to reach topping off. This level of success required excellent collaboration between the various teams involved. Seagate Structures handled the install, while Centura handled the installation of envelope panels. The project’s general contractor, Urban One Builders, ensured effective collaboration among all parties. UBC Brock Commons is expected to be move-in ready before September 2017 and will house more than 400 students during the school year. As the world’s largest timber tower, it is one of the most significant projects Structurlam has undertaken, and shone a light on what is possible when it comes to building with mass timber and CLT. Beyond accelerating the construction process, CrossLam® CLT and Glulam PLUS allowed for a lighter overall environmental impact, both during the building’s assembly and over its lifetime. Brock Commons will be a landmark on the UBC Campus and will hold its place in history as the world’s tallest timber tower.